Yesterday marked the end of one chapter in our lives and the beginning of another. As Edgar joked, "we are now both adults." See this image much larger (and in living color rather than as a black and white memory) here. Congratulations! And here I am, almost 30 and I still dont feel like an adult. Sometimes. 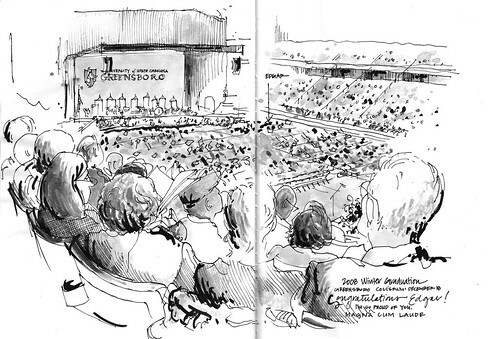 I like the loose graduation/crowd sketch. A really nice composition. I like both the blk/wht and colored versions. absolutely beautiful sketch and many congrats!!! Great job on a crowd scene! And congratulations! Is the color in this sketch done on a Wacom? I'm interested to know what kind of brush(es) you used in Photoshop?